The Frequent Player Points race continues through March at Intertops Poker. This month there's $100,000 up for grabs in the Intertops Poker $100K Points Race. There'll be four $20K Weekly Races and one $20K Monthly Race, giving players five chances to claim a share of the $100K prize pool. You can earn Frequent Player Points just by playing at Intertops. Four Weekly Races will pay the top 350 point earners a share of $20,000 and up to $1,500 every week. All four Weekly Race point totals will be combined for the Monthly Race where the top 350 will earn a share of the final $20,000. A total of 1500 cash prizes will be awarded this month. 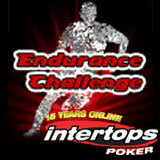 The popular Intertops Endurance Challenge also returns in March. It’s all about Points and playing as few as five days can qualify for entry in a $750 Freeroll. More frequent players can win more cash and entry into a $1000 or $1500 free roll. No registration is required. Players automatically earn points as they play and can check their standings any time on the FPP Scoreboard. The Knock-Out Challenge continues in March. Every second weekday this month, Intertops Poker is hosting two special Bounty Tournaments, each with two chances to cash in. Tournament players not only win money, but also earn one point for every player they eliminate in the process. The more opponents you eliminate, the higher your rank on the leaderboard and the bigger your share of the prize pool. At the end of the month the player with the most points will be declared the Knock Out Champion and the top ten point scorers on the Knock Out Challenge Leaderboard will split $1000 in prize money. Knock-Out Challenge Tournaments will be held every Monday, Wednesday and Friday in March at 6pm EST and 10pm EST. Buy-in is only $5+0.5 and $2 of that becomes a bounty on the player’s and their rival’s head. Tournament details are provided on the Promotions tab at Intertops Poker (http://poker.intertops.eu/en/promotions/#item_1608). Intertops was one of the first online casino, poker and sportsbook sites on the internet and has been trusted by players around the world for more than fifteen years. They take pride in their friendly customer service and their reputation for hassle-free deposits and withdrawals.